Emmeline Pankhurst’s great-granddaughter given CBE honour but still "so much needs to be done"
Emmeline Pankhurst’s great-granddaughter declared that there is still "so much that needs to be done" while being honoured with a CBE for campaigning on gender equality. 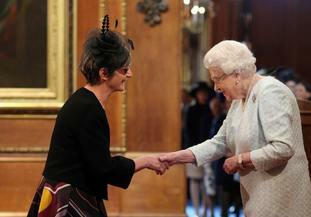 Dr Helen Pankhurst, who is descended from the famous suffragette, was handed the honour by the Queen at Windsor Castle on Friday - but labelled companies slow to publish gender gap details a "disgrace". The activist said that while it is important to “celebrate success” on the progress of gender issues, there is still “so much that needs to be done”. Dr Pankhurst said that companies need to engage better with gender issues, calling it “disgraceful” that two-thirds of companies are yet to publish their pay gaps with around a fortnight to go until the deadline. She said: “I think it really is disgraceful. What would the suffrage campaigners make of the world today? She added that there was also some “hiding of the data” in cases such as partners of law firms not having to declare all their income. Dr Pankhurst, who is also a writer and academic, said that a key area of progress on gender issues is that “there are so many men who are happy to call themselves feminists that are more involved in bringing up their children and caring for their parents”. The University of Suffolk installed Dr Pankhurst as its first chancellor in December. But what would her great-grandmother think of the accolade? “I think the fact that I am being given an honour on gender equality issues and people are still talking about the need to continue to address gender equality… I think she would be amused, but obviously delighted,” Dr Pankhurst added. Also honoured at the ceremony were Greggs chief executive Roger Whiteside and Microsoft UK CEO Cindy Rose, who both received OBEs.